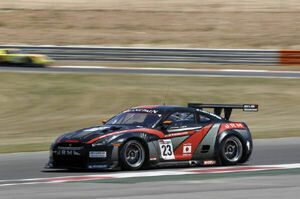 Nissan GT-R finished third behind dominant Lamborghinis. 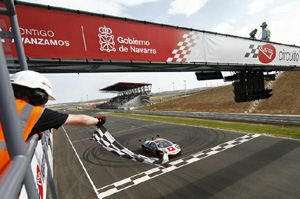 Round 6 of the 2011 FIA GT1 World Championship took place at the Circuito de Navarra in Northern Spain on the weekend of July 2nd and 3rd, 2011. Both races were won by the All-Inkl.com Münnich Motorsport racing team, with the No.38 car of Winkelkock and Basseng finishing frist in the Qualifying Race and the No.37 of Schwager and Pastorelli winning the Championship Race. Leading the GT-R pack, the No.21 Sumo Power GT car of Campbell-Walter and Brabham finished 4th in the Qualifying Race and third in the Championship Race. The best JRM Nissan GR-T, the No.22 car of Dumbreck and Westbrook took a 7th in the Qualifying Race and 6th in the Championship Race. The All-Inkl.com Munnich Motorsport Lamborghini team gave an excellent display of formation flying to complete a one-two finish in the Qualifying Race at Navarra. 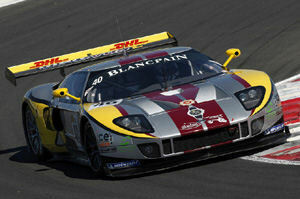 Marc Basseng and Marcus Winkelhock took the chequered flag in the No.38 car from pole position with the sister car, the Lamborghini No.37 of Nicky Pastorelli and Dominik Schwager, close behind in second. With the Lamborghinis so dominant, the rest of the field was left to scrap over the final place on the podium. After an eventful squabble it was the Marc VDS Ford GT No.41 of Maxime Martin and new driver Bertrand Baguette to take the honours. 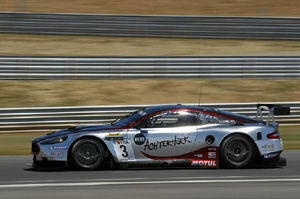 The No.21 Sumo Power GT shared by David Brabham and Jamie Campbell-Walter finished highest placed amongst the four Nissans in fourth place. The No.22 JRM of Peter Dumbreck and Richard Westbrook finished just outside the points in seventh, two places ahead of team-mates Lucas Luhr and Michael Krumm in the No.23 car. The No.37 Lamborghini Murcielago of Pastorelli had a better start than the pole sitting No.38 sister car of Basseng and took the lead into the first turn. Behind them Maxime Martin in the No.41 Ford GT got alongside the No.23 JRM Nissan GT-R of Michael Krumm into the second turn, pushing the Nissan GT-R off the track. The Ford nipped through but the Nissan GT-R suffered some damage to the exhaust which caused it to lose power. Krumm dropped back to 15th at the end of the opening lap but struggled on until after a few laps the fault cleared and the German driver started to move back up the order. Likewise, Martin in the No.41 Ford GT dropped back behind his team mate Marc Hennerici in the No.40 Ford GT, with the No.11 Exim Bank Team China Corvette of Nico Verdonck and the No.3 Hexis AMR Aston Martin DBR9 of Stef Dusseldorp in third and fourth respectively, just ahead of the battling pair of Fords. The other Nissan GT-R's, starting eight (No.20), ninth (No.22) and tenth (No.21) on the grid after Qualifying, also lost places whilst trying to avoid the on track spin of the No.9 Belgian Racing Ford GT, ending lap one off the pace in ninth (No.20), tenth (No.22) and 12th (No.21) positions respectively. Martin in the No.41 Ford GT passed Hennerici in No.40 on lap 5 and then three laps later overtook Dusseldorp for 4th and was soon challenging Verdonck in the No.11 Corvette for third. An aborted attempt to overtake on lap 11 at Turn 9 showed the Ford GT had the extra pace through the corners but lost out to the Corvette on the straights. Two laps later Martin muscled his way past the Corvette at Turn 6 but had to fight hard to keep the position, which he secured at Turn 8. 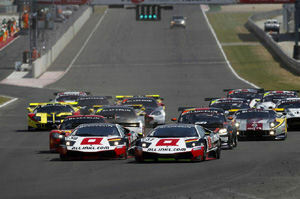 At the front the No.37 Lamborgini of Nicky Pastorelli and the No.38 car of Marc Basseng were circulating together separated by less than one second as the pitstop window opened. Basseng was the first to pit on lap 16, with Pastorelli pitting a lap later. Markus Winkelhock, now at the wheel of the No.38 car, came down the pit straight just as Dominik Schwager in the No.37 Lamborghini emerged from the pitlane and Winkelhock swept past his teammate into the lead as Schwager started to get up to racing speed. Apart from Westbrook overtaking Catsburg for ninth and Brabham and Krumm moving up one place each, there was to be little change in the GT-R's positions in the first half of the race as the opening of the pit window approached on 25 minutes, meaning good pit stops were vital for all four cars. Happily, the stops were just that, in particular that of the No.21 Sumo Power GT which emerged in sixth, moving up a further place to overtake the No.11 Corvette and claim fifth on its out-lap. Further back the field, more quick work by the team's pit crews had helped the GT-R's rejoin the race in eighth (No.22 JRM), 11th (No.20 Sumo Power GT) and 12th (No.23 JRM). The No.3 Hexis Aston Martin DBR9, now with Clivio Piccione at the wheel, also got a better stop and was door to door with Mike Hezeman's No.11 Corvette Z06, with the Exim Bank Team China car getting the better of the Aston. However as Hezeman braked for Turn 3, the Aston Martin ran into the back of the Corvette damaging the rear bodywork of the car and tire smoke was seen as he drove away. This later resulted in a puncture for the Corvette and its retirement, while the No.3 Hexis AMR Aston Martin was given a drive through penalty as a result of the accident. The Nissan GT-R's fared much better in the second half of the race, with Dumbreck moving up to seventh in the No.22 JRM car, and Bernoldi, in full flow, gaining a couple of places to move up to ninth in the No.20 Sumo Power GT-R. However, the Brazilian was to suffer misfortune moving into the final quarter of the race, opting to pull into the gravel at a designated fire-point after seeing flames coming from the left hand side of his car. That left three Nissans in the race, and there was to be action involving two of them in the final stages as Luhr made a late push to move up two places to ninth in the No.23 Nissan GT-R, having earlier gained a place due to Bernoldi's retirement. Meanwhile, the No.4 Hexis Aston Martin of Christian Hohenadel in third was tracked by Bertrand Baguette in the No.41 Marc VDS Ford GT and Jamie Campbell-Walter in the No.21 Sumo Power Nissan GT-R. On lap 25, Hohenadel lost the final podium place to the Ford and then soaked up the pressure as Campbell-Walter also tried to overtake the No.4 Aston Martin. Two laps later, the leading Lamborghinis crossed the finish line just 3.3 seconds apart, with Hohenadel securing the thrid position ahead of the No.21 Nissan GT-R. 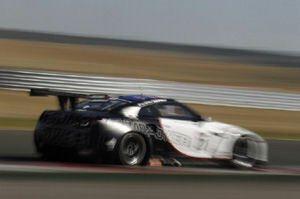 Speaking afterwards, David Brabham said: "I'm really pleased with that result. Our strategy at the start was just to keep out of trouble on the first lap, and I was perhaps a bit too cautious, breaking hard three times in the opening minute or two alone. I then took a real risk in order to make a strong pass and move up a place, and after that there were no other real opportunities to move higher up the field." "Once again, Jamie and I have to give a huge thank you to the pit crew for the amazing job they did in gaining us so many places, and it was great that Jamie could really capitalise and gain a further place to take fourth during his stint in the car. A very good result considering where we started and how far down the field we were at one point." 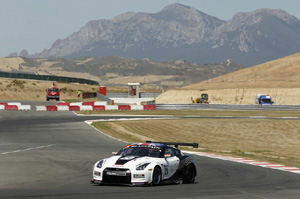 Brabham's team-mate in the No.21 Sumo Power Nissan GT-R, Jamie Campbell-Walter, added: "Firstly, I thought David did a great job to avoid the first lap traffic- that was the most important thing for us starting quite far back in the field, and he had a tough job on his hands. Secondly, it goes without saying that the pit crew deserve massive plaudits for the job they did, and I'm happy I was able to take advantage of their efforts and steal fourth away from the Aston on the back-straight late on." "Despite the great result, the car was struggling with high tyre pressure throughout my stint, so I had to be quite careful. If we can get that sorted for the Championship Race tomorrow, then I think we stand a really good chance of grabbing a place on the podium, and of course it's a massive bonus that we'll actually be starting in third place on the grid. Let's keep our fingers crossed!"